When things rotate around an axis they have what’s called angular velocity. A spinning wheel can be measured in revolutions per second (RPS) or degrees per second (°/s). Note that the z axis of the gyro below aligns with the axis of rotation on the wheel. If you attach the sensor to the wheel shown above, you can measure the angular velocity of the z axis of the gyro. The other two axes would not measure any rotation. Imagine if the wheel spins once per second. It would have an angular velocity of 360 degrees per second. The spinning direction of the wheel is also important. Is it clockwise around the axis, or is it counter-clockwise? 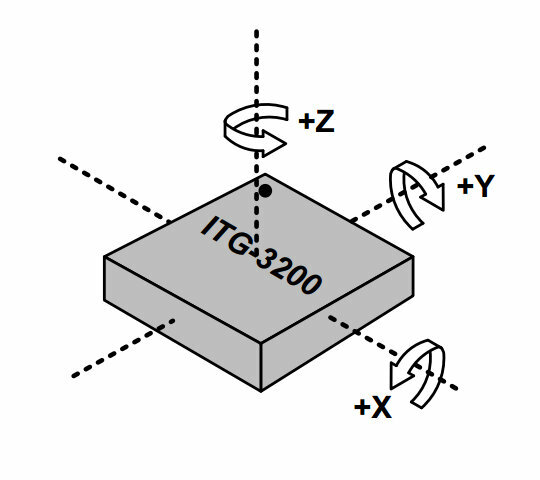 A triple axis MEMS gyroscope, similar to the one pictured above (ITG-3200), can measure rotation around three axes: x, y, and z. Some gyros come in single and dual axis varieties, but the triple axis gyro in a single chip is becoming smaller, less expensive, and more popular. Gyros are often used on objects that are not spinning very fast at all. Aircrafts (hopefully) do not spin. Instead they rotate a few degrees on each axis. By detecting these small changes gyros help stabilize the flight of the aircraft. Also, note that the acceleration or linear velocity of the aircraft does not affect the measurement of the gyro. Gyros only measure angular velocity. How does the MEMS gyro detect angular velocity? The gyroscope sensor within the MEMS is tiny (between 1 to 100 micrometers, the size of a human hair). When the gyro is rotated, a small resonating mass is shifted as the angular velocity changes. This movement is converted into very low-current electrical signals that can be amplified and read by a host microcontroller.